In 1973, President Richard Nixon was faced with an energy dilemma. The Arab cartels were putting the squeeze on the oil companies and a gasoline shortage ensued. People were waiting on line to buy fuel and a panic was rising among the populace. Many controls were tried in order to conserve energy. Rationing was invoked. One day only cars with even plates could get gas, the next day cars with odd number plates. Another solution was to impose a national fifty-five mile per hour speed limit. Many states already had a fifty-five limit, but under threat of federal highway funds being withheld all of the other states fell in line, except Montana, they never had a speed limit and weren’t going to be forced to have one by the Feds. At face value the national speed limit wasn’t a bad idea. It does save gas to drive slower and it reduces pollution. The powers that be also told us that it reduced traffic fatalities. We were propagandized with the phrase, “Speed Kills.” If your speaking about illegal drug use, you would be correct, but as far as highway use it was a lie. The new limit also had some other side affects that were beneficial to the government and industry. During the duration of the fifty-five limit many grass roots organizations fought the speed limit. It was breeding disrespect for government, highway police and insurance companies because no-one obeyed it anyway. But it was a money maker to all those powers. Money flowed from our pockets into the coffers of mega corporations and minor governments at an alarming rate. Local judges presiding in small municipalities that reside along highways were bringing money into their towns reaping the financial windfall from the increasing number of speeding tickets. Insurance companies raised the rates that they charged to drivers convicted of speeding and the Feds were just plain enjoying having the power over the states, they were able control one more aspect of our lives. As the gas shortage became a small footnote on the pages of Nixon’s career, our own federal Department Of Transportation began a serious study on the effect of the fifty-five limit. The study showed a negligible reduction of traffic fatalities. Many accident reports placed “excessive speed” as part of the cause, but despite a continuing government conspiracy the report proved that speed alone didn’t kill. That DOT report was published during Ronald Reagan’s reign, and summarily squashed. But during the Bush presidency it was leaked to the people fighting the speed limit. Now we had evidence created by the very powers that they were fighting against. It took more than thirty years to prove it but the facts show that the lower speed limit doesn’t affect the traffic fatality rate at all. Most fatal accidents happen at or below the fifty-five miles per hour line. And I haven’t even mentioned the quality of the vehicles that we drive compared to three decades past. We are now enjoying a sixty-five mile an hour speed limit on most of our highways. But did you noticed that when the sixty-five miles per hour speed limit signs were erected there was a new twist. The phrase, “fines doubled” was added. The repeal of the fifty-five mile per hour limit happened to the chagrin of the insurance companies and municipalities that I mentioned before. They cried that there would be carnage on the roads, more people would die, but the truth is that they saw their financial free ride flying out their power windows. They were spending more money on high tech cop cars with computers, Vascar, Radar and Laser speed detectors. They have to pay for these toys. Enter the reality of political compromise; raise the limit but double the fines. When New Jersey put the new higher limit signs up, Governor Christy Whitman said that it was only a test, and if the accident rate went up then the limit would go back down. Meanwhile her own chief of the state troopers was quoted in a newspaper as saying he himself had to exceed the stated speed limit on the Garden State Parkway because if he didn’t someone would drive up his...uh, trunk. The chief was forced to recant. Meanwhile the accident rate dropped, and the new limit will remain. That’s it for the history lesson, here’s the story; last week I picked up BMW’s new K1200LT for an evaluation. It’s a motorcycle that is made in a country whose highways have no speed limit at all. It’s also a triumph of millennium technology. The bike has anti-lock brakes, electrically controlled windshield height, heated seats and grips, a heated backrest for the passenger, electronic cruise control, and a six CD stereo changer. I took possesion of the bike at Bob’s BMW in Maryland with plans to ride it all the way to our offices in Nyack, just north of New York City. The weather was a bit on the hot side for full leathers, but I always dress for the ride. I left Bob’s about 11 am for a full days touring. I rode the secondary two laners through the picturesque farmland of Maryland, took the Bay Bridge over the Chesapeake then boarded the ferry, two hours later I was in Cape May, New Jersey. I treated myself to a broiled fish dinner on Beach Street then began the one hundred and ninety mile trip home. Travel plans included the Garden State Parkway for its entire length, the very same parkway that had chief of the New Jersey State Troopers breaking the speed limit. Then I’d take the New York State Thruway east for a few miles. It was six o’clock when I left Cape May. The ride up the Parkway was the best that I’d ever had. The temperature was dropping slowly, the thermometer from the onboard computer read 78° and the sun was making its journey toward the horizon at a snail’s pace. I realized that it was the summer solstice, and I’d spent most of the daylight hours on the longest day of the year riding a bike. To say the least. I was very happy. I kept the motorcycle in the left lane, cruise control set at eighty miles-per-hour. The windshield was cranked all the way up and so was the stereo. I kept checking my mirrors, I passed cars steadily but still had to move over many times for someone to pass me. And I didn’t see a police car the entire ride. At nine PM, when the last rays of daylight faded from the sky I pulled into the Montvale service area, the final gas stop on the Parkway. I topped off the tank then began the last few miles home. I felt no fatigue at all, the K1200 performed flawlessly and was as comfortable as my favorite chair. Two more exits to go, a mere three miles, and I looked over my left should to see if the lane was clear then passed a group of cars that were doing their bumper to bumper NASCAR impression at seventy miles an hour. The speed limit in that area is only fifty-five. I put on my right signal, looked over other shoulder and moved into the right lane. That’s when I heard the siren and saw the red whoopee lights. In no time I was stopped on the shoulder. I took off my helmet and waited for the cop. He was a little guy with a big flashlight. I didn’t give him a chance to speak, I looked at him and said, “Man, I’m sorry I made you put on your lights and chase me down.” I held up my thumb and forefinger, “look I’m this far from home, I’ve been on this bike all day, I started in Baltimore, I’m just this far (fingers again) from home,” I pleaded. “Well here’s my license, but I don’t have a registration, this is a manufacturer’s bike that I’m test riding, I do this for a living. Hey I’ve got all these PBA cards,” I fanned out the handful of plastic cards that my police friends had given me. “They aren’t gonna help you this time.” he was getting stern. I knew that I must have been doing about eighty-five when he spotted me. “Come, on, I do this for a living, I’ve got a clean license.” Just then two kids on crotch rockets with loud aftermarket pipes blew by. They were wearing full face helmets with t-shirts and shorts. One turned his head and looked at us. “I’m gonna check your license,” was all he said, then he walked back to his cruiser. As I sat there I envisioned him in the cruiser’s air-conditioned cocoon, surrounded with all the latest cop techno-gadgetry, punching the number of my license into his computer terminal. I imagined the electrons bouncing back and forth to some antenna then to Albany, then to some criminal database. I knew that the info would come back clean. But thousands of years from now, that signal would reach a planet in some distant galaxy and some alien scientist will know that I was pulled over by a cop during Earth’s summer solstice. The Trooper walked back to me and the bike, then returned my license. “It’s your lucky day,” he said, “but I want you to drop off a copy of your magazine at the barracks so I know that you’re telling the truth.” I opened the saddlebag and gave him a copy, on the spot. He didn’t give me a ticket because I was licensed, properly equiped and pleasant, plus he knew that the limit only exists to raise money. If we trained our drivers better we wouldn’t need to argue this and we could send our troopers out to chase down violent criminals. But money talks in our society and the car and insurance companies would rather sell more products to make more money, and there is no money in arrestng a deadbeat dad or finding a fugitive. If it was more difficult to get a drivers license or you couldn’t buy a vehicle without proper training our roads would be a lot safer, regardless of the legal speed limits. 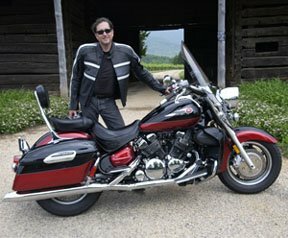 As I drove off, thrilled with having one of the most perfect rides of my professional moto-journalism career, and with talking my way out of a “NYS Excellent Driver Citation,” I realized something. The edition of CC Motorcycle Newsmagazine that I gave him carried the story about my ride from Minneapolis to Duluth on a Ducati 900ss. One hundred and seventy miles in the rain, travel time; an hour and a half. I hope he doesn’t read it, because if he does and I ever run into him again, I’m screwed. But hey, it’s my job.